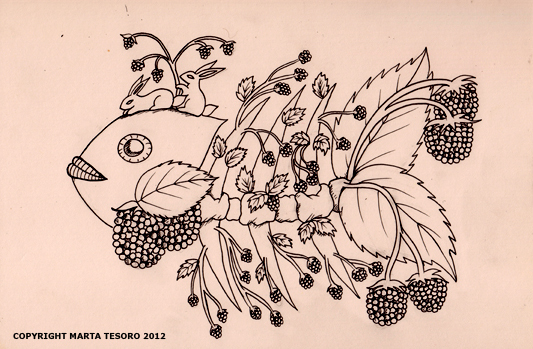 Blackberry fish inked up. I still need to paint it and get it ready for submission to an exhibition next week. I am entering 5 berry fishies there. Looking forward to it! I've never exhibited in a gallery before and before the end of this month I will be exhibiting in two! Both are group exhibitions...sooner or late I will attempt a solo one. I had a rather lacklustre performance at the gym today....and that is putting it lightly. That was a complete debacle. I am back to metabolic training and it would seem that I have gotten complacent over the last few weeks and it showed. I should be grateful that the minute I have ever gotten complacent in anything in my life...I get my behind handed to me on a plate because I always get back up and do better because of it. For other news, looks like I've managed to catch up on freelance work and stay on target with my homework too. Hurrah!